What I love most about those crêpes is the color, and no it’s not a corn pancake, the deep yellow color comes from turmeric. I ate something similar at a friend’s house from Cambodia a long time ago, except that pork and crab were replacing the shrimps. I also wanted to use the rice flour and wood ear mushrooms I had bought and that I never use. 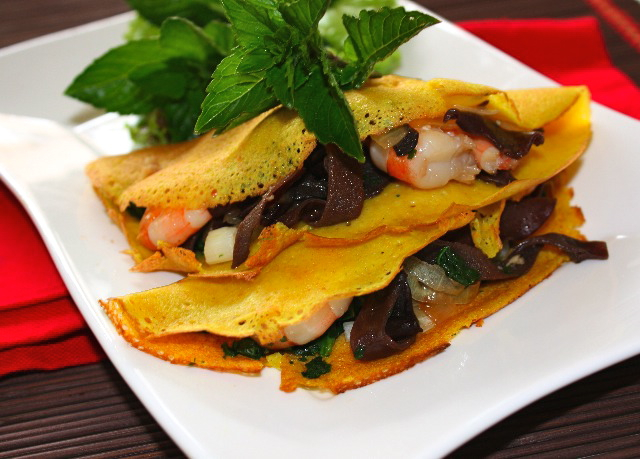 So I decided to give it a try…crêpes with an Asian twist. I think those crêpe have more than an Asian twist. The crêpe batter tends to be on the soft side, so you need to cook each side really well, until almost crunchy. I used a combination of brown rice and Khorasan wheat flours which even though does contain gluten, is easier to digest than regular flour and has a higher protein content. You can find fresh wood ear mushrooms at the Asian market, I used the dry kind. I would have used shitakee if I had some, but the wood ear mushrooms were perfectly fine, beside, since I cook with shiitake a lot, I figured those mushrooms would be a little more original. They’re firm with a thick skin and interesting texture resembling jelly. Their texture has a crunchy bite which I find very pleasant. For the stuffing, you can certainly use what you like, the crepes have a subtle coconut flavor, so ground meat would also work. Mix flours together, then add egg, water, coconut milk, turmeric and salt. Mix well to obtain a smooth batter. If too thick add a little water. Let it rest for about 30 min. Soak mushrooms in hot water until they become soft, about 30-45 minutes. Cut in small strips. Set aside. Marinate mushrooms strips with shrimps, fish sauce, sugar, garlic for about one hour. Saute spinach in 1 garlic clove chopped and olive oil. Heat olive oil in a wok, add mushrooms and shrimp mixture and saute until shrimps are cooked and liquid has evaporated. Start making crêpes. Using a small pan of about 12 cm diameter, add some batter and proceed as you would make regular crêpes, spreading the batter all over the pan. 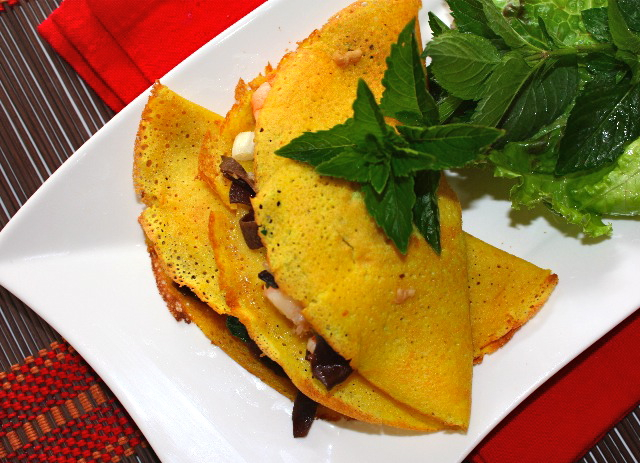 Let it cook until one side of the crêpe, has become golden brown and crunchy. Add some of the filling on one half of the crêpe, add spinach and scallions. Fold the other half on top and let it cook for a few more minutes. Remove from the pan and serve with mint and lettuce leaves. This entry was posted by silvia on September 18, 2010 at 5:39 pm, and is filed under Appetizers, Fish/Seafood. Follow any responses to this post through RSS 2.0.You can leave a response or trackback from your own site. Interesting flavors that intrigue me for sure in this one, love it all! I love that subtle touch of coconut in the crepes – they must amazing. Ooo… how lovely is this! I bet the crisps smell fantastic with that extra touch of coconut. Btw, are you participating in FB challenge? Hope to see you in there. You’re such a talent. Hope you’re having a fabulous day. Silvia, ça fait un bail que je n’ai pas mangé des crêpes, il est temps… surtout avec une préparation savoureuse et unique comme celle-ci. C’est intriguant de voir l’utilisation des ingrédients asiatiques dans une crepe. Bravo! I have been trying to incorporate more tumeric in my diet (great taste and great for your health!) These crepes are such a lovely color, and I loved seeing the amazing shrimp filling you concocted. So very good! Oooh….that’s delicious! I love coconut in pancakes and I see my big favourite prawns there This would be lovely for my lunch. 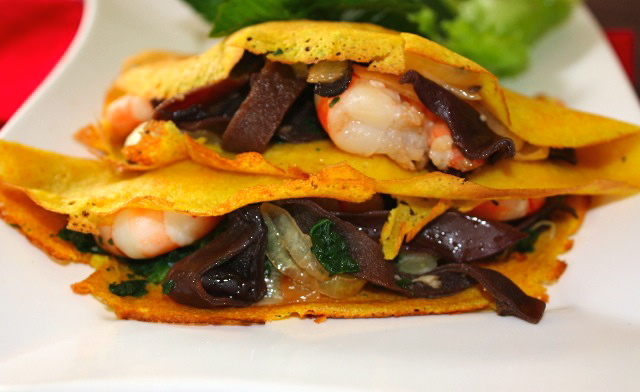 What a fantastically savory crepe. Love the color. A little inspiration from a friend…a little curiousity by Silvia…and voila, a whole transformed meal using crepes and a few other interesting things. There are certainly 3 things I’m taking away from this: coconut milk will be added to my next fav crepe recipe, the turmeric color is just gorgeous…especially for a savoury meal, and lastly is those mushrooms which I’ve seen dried at Asian stores…and yet never thought of buying. I love shiitakes and no doubt will use them in the filling. Really such an original dish! I’m looking forward to trying it. What a fantastic combination of flavors. I could eat wood ear mushrooms every day of the week and can only imagine how good they would taste tucked inside of these pretty crepes. Fantastic crepe. Love the combo of flavors. Another wonderful creation. Fantastic dish, as always! I love the use of coconut and turmeric..wonder if I could substitute chickpea flour? 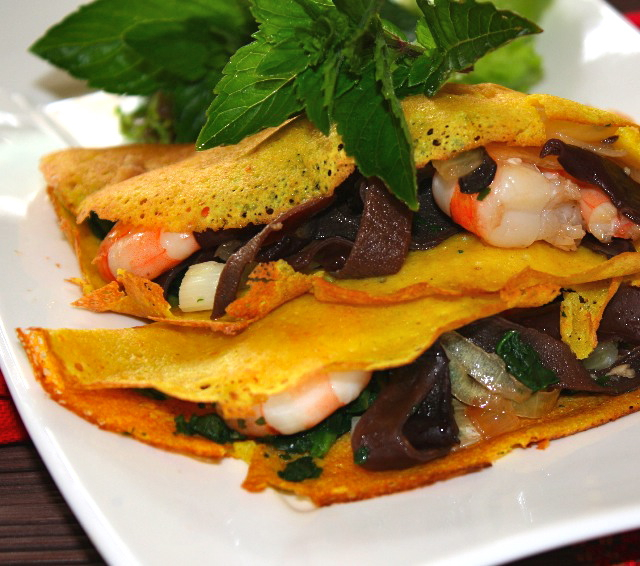 This reminded me of Vietnamese crapes/pancakes! The flavor sounds great. Coconut and turmeric work so well together. Your curiosity just created a wonderful dish Silvia! Fantastic creation. Love the coconut and turmeric flavor combination and the rich brown of those wood ear mushrooms.